Peace soon for South Sudan? Khartoum hosted the second round of talks between South Sudanese President Salva Kiir and his rival, former deputy Riek Machar, on Monday. Ethiopia’s capital, Addis Ababa, was where the two poles of the civil war in South Sudan met for the first round of talks, on 20 June, after both conceded to regional and international pressures to resolve conflict in the world’s latest independent country. The Addis Ababa meeting, despite being the first for the two men in two years, bore no tangible results. It was mediated by Ethiopian Prime Minister Abiy Ahmed, with the support of the Intergovernmental Authority on Development (IGAD), in the attendance of a number of leaders from neighbouring countries. South Sudan attained independence in July 2011. Two years later civil war broke out when Kiir dismissed Machar after accusing him of conspiring to overthrow him. The infighting claimed the lives of tens of thousands and rendered millions displaced. The oil-rich country arrived to the verge of famine, according to the UN and humanitarian aid organisations. For five years, since civil war erupted in 2013, regional and international powers tried to no avail, and despite sanctions imposed on both parties, to mediate between the two warring factions to strike a peace deal. Until 2015 a bloody war raged between Machar’s White Army, comprising armed Nuer tribesmen, and the South Sudanese army and the Dinka tribe, from where Kiir hails. With the help of IGAD, the two warring camps reached a peace agreement, according to which Machar was allowed back into the capital Juba. The ceasefire failed in June 2016, forcing Machar to fly to South Africa, where he remained until the Addis Ababa talks that took place last week. There is no end in sight for the tribal fighting between Kiir’s Dinka, making up the majority of the Sudanese army and state employees, and Machar’s Nuer. The conflict between the two tribes is deeply rooted in South Sudanese culture. The rift between the Dinka farmers, comprising the majority with 37 per cent of the citizens, and the more organised and armed Neur tribe, forming 16 per cent of the population, has created one of the African continent’s worst upheavals. Machar has repeatedly demanded that Kiir step down, insinuating he was more fit for the presidency than Kiir. A Machar presidential win, however, does not seem possible given that Kiir’s Dinka comprises the majority of the population. In addition, most of the countries in the region will reject Machar’s ascent to power as long as he doesn’t take part in the peace process. The Associated Press reported that IGAD said Machar should be free to leave South Africa, where he had been under house arrest for “any country of his choice except the IGAD region”. 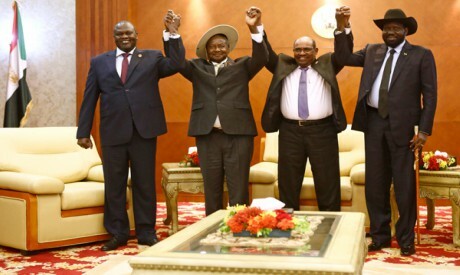 East Africa leaders stated that Machar was not welcome in their countries except to join peace talks on his country’s five-year civil war. Their statement came in line with Makuei’s. Makuei objected to Machar’s taking part in the government, even as a minister, still less as vice president. He didn’t, however, rule out the possibility of opposition figures participating in forming a transitional or a national unity government. The South Sudan People’s Liberation Movement-in-Opposition (SPLM-IO), led by Machar, condemned as “irresponsible” Makuei’s statements “which impede efforts to revitalise the peace process”. During the talks, Machar said those efforts were “unrealistic” and that time is needed to achieve peace in South Sudan. The pressure is rising against the opposition leader, with nowhere left for him to hide if he refuses the next peace offer. South Africa is not a permanent station, but rather, according to observers, was a temporary “hideout” arranged by Khartoum for fear for Machar’s life, after he was earlier exposed to assassination attempts. The Nuer tribe clings to its leader Machar for fear of being disassembled in the case of his absence. All the more reason for them to continue fighting. In the field, however, the Nuer have been suffering successive losses, which drove tens of thousands of them to leave the country and reside in Ethiopia. The South Sudan army has been adopting the strategy of invading Nuer villages, thus emptying opposition strongholds of their population, depending on weapons from neighbouring countries, especially Uganda. Nuer’s regression may push some opposition figures to join the government out of fear of losing “everything”. Conceding to peace efforts may negatively affect Machar’s popularity and credibility among Nuer tribesmen who made major sacrifices to drive Machar to the top and consequently benefit from him. Machar’s deteriorating popularity will lead to him losing control over the White Army, which if disintegrated will result in smaller, violent and criminal organisations the sole aim of which will be enlarging their fortunes. The keys to dismantling the state of war remain in Machar’s hands, nevertheless. The problem is Machar’s ties to Khartoum, according to accusations made by Juba and disclaimed by the regime of Sudan President Omar Al-Bashir. It looks like while Juba seeks to sever ties between Sudan and Machar, it has started technical negotiations to re-operate the oil industry in the country which has only Port Sudan as an outlet. A successful oil industry in South Sudan will tighten the siege on Machar as the government becomes stronger thanks to oil revenues. At the same time Khartoum lacks substantial hard currency revenues that enables it to let go of Machar. In light of Ethiopia’s desire to seal a peace deal with its archenemy Eritrea, and the ongoing efforts to pacify the situation in Somalia, the armed opposition in South Sudan is finding it more difficult to survive in a region eager to leave behind a long life of instability. *A version of this article appears in print in the 28 June 2018 edition of Al-Ahram Weekly under the headline: Peace soon for South Sudan?